Rian Raksa Paen Din Thai - Protection of the Nation Commemorative Amulet of the Guru Monk Luang Phu Waen Sujjino, of Wat Doi Mae Pang, from the year 2520 BE, made from 'Nuea Tong Daeng RomDam' Sacred Copper Alchemical Alloy with Black Oiled Finish. The amulet is and eight sided coin, with a raised upper edge, and the Sacred Unalome crowning it, and features the Cameo image of Luang Phu Waen. This exhibit is in absolutely pristine condition, and a highly attractive amulet for Bucha. Its details are incredibly well preserved with extreme clarity, making this a 'Niyom' Class amulet of competition entry status. The rear face bears the Vishnu Chakra disk with the Royal Crown (Mongkut Yord Chai), with a Towering Victory Spire, emanating Rays of Light, resembling a Chedi Stupa Spire. Below the Chakra disk (which also alludes to the King, who is considered an Emanation of Vishnu) are the words "Raksa Paen Din Thai' which mean 'Preserve and Protect the Kingdom of Thailand'. 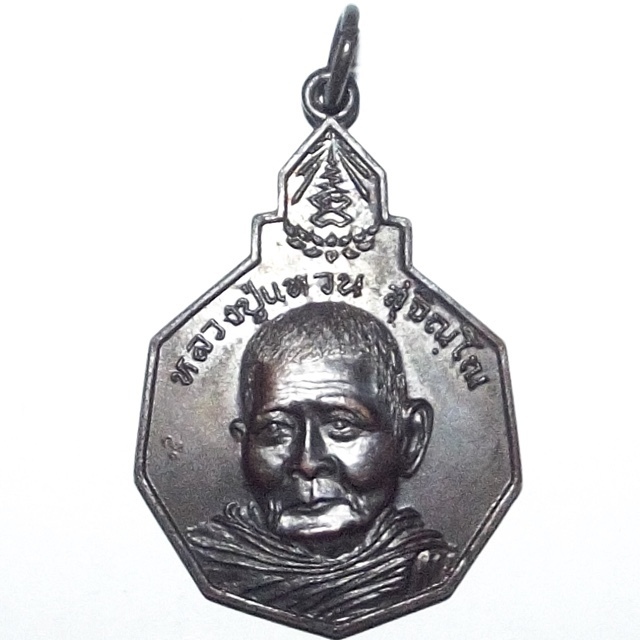 Below these words on the bottom of the rear face of the coin, are the words 'Wat Doi Mae Pang, Janwat Chiang Mai'. The upper left side of the coin has Sacred Khom Agkhara with Kata Akom, which say 'Putto Arahang Tammo (Buddho Araham Dhammo). The top right side of the coin also has Kata Akom in Khom which says 'Arahang Sangko Arahang' (Araham Sangko Araham). 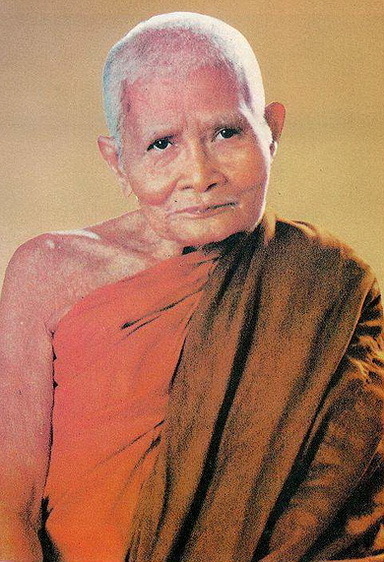 Luang Phu Waen Sujinno (Thai: หลวงปู่แหวน สุจิณโณ, meaning Venerable Grandfather; 16 February 1887 – 2 July 1985) is one of the longest living students of Pra Ajarn Mun Bhuridatta and was a very popular monk in Thailand. He led the Tudong Forest Tradition life, until the point where he could not physically travel any more and had to settle in a forest monastery in the Chiang Mai region. Luang Phu Waen Sujinno was a monk highly skilled in Samadhi and Dhamma. He disliked crowded places. He loved to live alone in the forests away from people and urbanized areas just like his teacher, Ajarn Mun Bhuridatta. Some people said that Luang Phu Waen had achieved Arahant level. Luang Por Jao Khun Nor had mentioned that "There is a Pra Arahant, but he lives far away, in the forest". Luang Phu Waen was born on 16 February 1883 (BE 2431) in Tambon Na Pong, Mueang District of Loei, Northeast (Isan) of Thailand to a blacksmith's family. He was named Yan, and had one elder sister. He ordained as a novice in 1892 at Wat Po Chai in Na Pong at the age of nine to fulfill the wish of his mother when she died while he was five years old. At the age of 13, he became a Naen (novice monk) at Wat Poh Chai, Loei province. He studied with teachers and later ordained as a monk at a temple in Hua Taparn District of Ubon Ratchathani at the age of 21. As a novice monk, he studied the Dharma and Pali, even at that young age he showed exceptional ability. He eventually went Thudong (forest monk) with his teacher, Ajarn Wuhan, travelling from Loei to Ubon Ratchathani, where he remained to learn Dhamma from another teacher, Ajarn Sing. During his Thudong, he met disciples of Ajarn Mun whom he had wanted to further his studies under. Luang Phu Waen met Ajarn Mun in BE 2462 (at the age of 31) at Bahn Korforest, Udon Thani province. 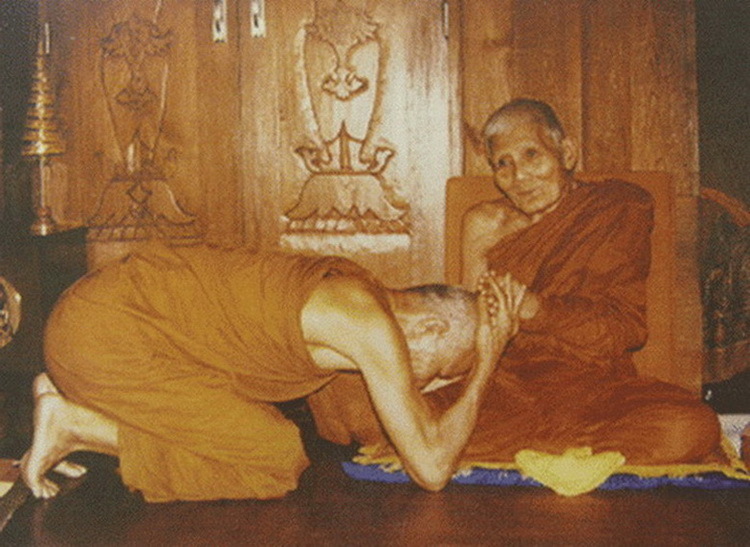 Luang Por Mun Bhuridatta in Udon Thani who taught him the pursuance of a secluded life and the practice of meditation and Dhamma in the jungles. Subsequently Luang Phu Waen travelled widely in the Northeast of Thailand in search of isolated places where he could meditate. His travelling also took him to Bangkok where he met Chao Khun Phra Upali Gunupamacariya of Wat Bowonniwet in 1921 with whom Luang Phu Waen spent several years studying and practising the Dhamma. Later Chao Khun Phra Upali took him to Wat Chedi Luang in Chiang Mai where Luang Phu Waen decided to change from the Maha-Nikaya sect of Buddhism to the stricter Dhammayut sect. Later he went Thudong again with Ajarn Dteu. During his Tudong, he encountered ghosts, wild animals and other dangers but was never afraid despite warnings from local villagers. It was his wish to experience and learn from everything. Luang Phu Waen spent most of his monkhood as a forest monk, travelling from one province to another on foot, climbing hills, crossing rivers and deep forests. He had also gone as far as Laos, Cambodia, Burma and even Vietnam on Thudong. At BE 2470, age 39, Luang Phu Waen arrived in Lampang. He met another disciple of Ajarn Mun called Ajarn Keow. He was told that Ajarn Mun was in Chiang Mai. Luang Phu Waen quickly Thudong to Chiang Mai to look for Ajarn Mun. Finally he met Ajarn Mun and Ajarn Dteu at Wat Chedi Luang. Ajarn Mun officially accepted Luang Phu Waen as his disciple. 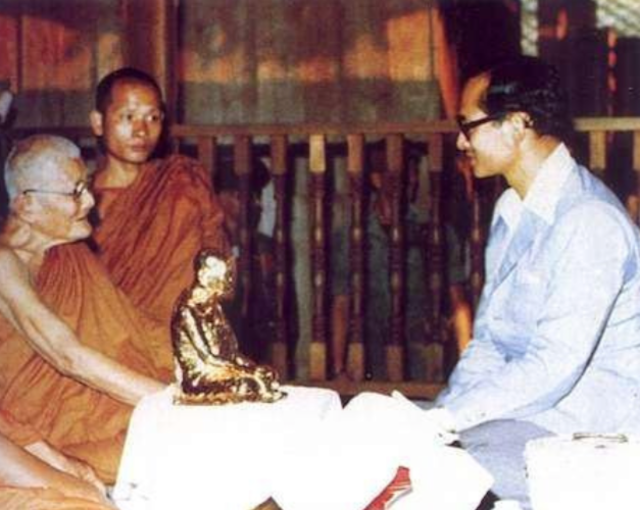 He studied Dhamma at Wat Chedi Luang. After Ajarn Mun left Wat Chedi Luang for Thudong, Luang Phu Waen also went Thudong in Chiang Mai. He stayed at Wat Huainumrin in Chiang Mai Province for 10 years. During his long stay in Wat Huainumrin, he stayed most of his time in forests and only returning to the temple during the rainy seasons (Khao Phansa). Luang Phu Waen travelled extensively by foot through jungles and across mountains and ventured to Burma and India where he paid homage to several historic Buddhist sites. 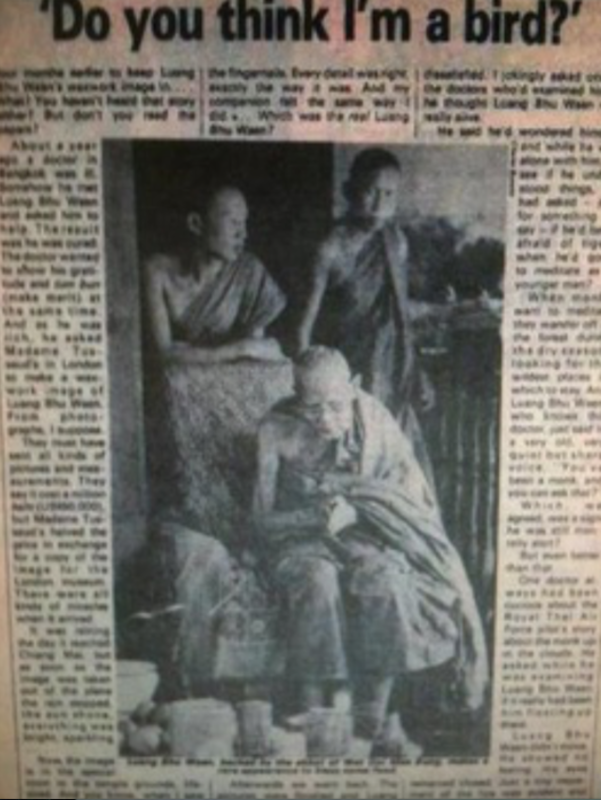 However, in 1955 news of a foot injury sustained during his stay in seclusion of Wat Paa Ban Pong in Mae Tang District, Chiang Mai, reached Pra Ajarn Noo Suchitto of Wat Doi Mae Pang who later arranged for Luang Phu Waen to stay in Wat Doi Mae Pang permanently. He resided in Wat Doi Mae Pang until his death. Luang Phu Waen entered Maharaj Hospital on 15 April 1985 when he was found unable to eat or move and was operated on 4 June 1985 in order to feed him through a tube which was inserted into his stomach. However, complications developed and Pra Ajarn Noo, the abbot of Wat Doi Mae Pang, requested doctors not to perform any more operations as he wanted Luang Phu Waen to rest peacefully. His request was accepted by doctors and the Chiang Mai Governor, Mr. Chaiya Punsiriwong. 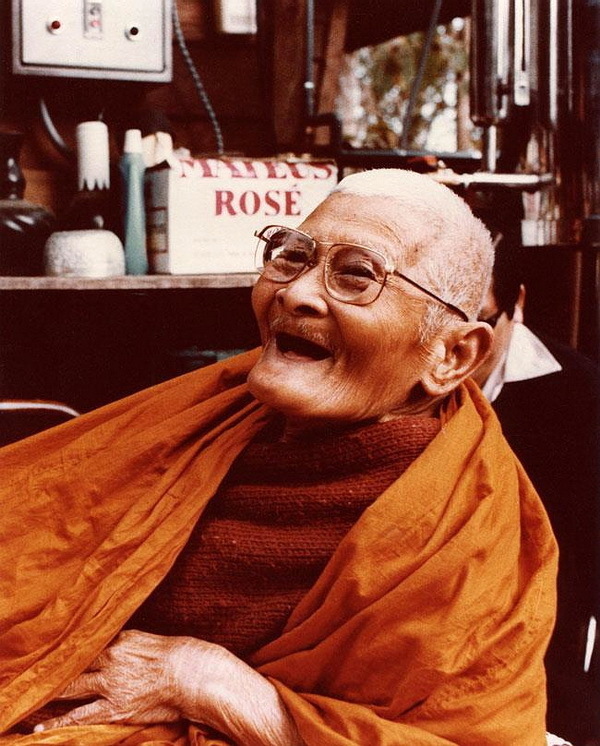 On 2 July 1985 at 9:54 pm, Luang Phu Waen finally died at the age of 98 years and 5 months after having been in the monkhood for almost 90 years. He was given a royal-sponsored bathing ceremony at Sala Ang Klaew in Chiang Mai University which was attended by the King and Queen of Thailand as well as the general public. His remains were cremated at a Royal Funeral on 16 January 1986. "Sujinno Building", a 15-level building of Maharat Nakhon Chiang Mai Hospital, was named in his honor. “What is sacred? Everyone has something sacred within themselves. To have been born as a complete human being is already sacred. One can be sacred only from within oneself, and not by any amulet or other so-called sacred objects. Dhamma is sacred, and to have this sacredness, one must have Dhamma within oneself.” (As a very popular monk, Luang Phu Waen is often rumoured to have “sacred amulets” - something which Thai people from all walks of life like to receive from revered monks - for their protective value. People from all over Thailand would often travel to Wat Doi Mae Pang to seek these amulets or other sacred objects from him. He would always give the same answer as the one quoted above.) Wat Doi Mae Pang (Thai: วัดดอยแม่ปั๋ง) is a Buddhist temple in Phrao district, Chiang Mai Province, northern Thailand. It is some 75 kilometres from the city Chiang Maion route 1001 towards Phrao. Local legends say that the road 1001 was built due to Luang Por Waen Sujinno. Legend tells of this monk meditating and floating hundreds of feet into the air. He was seen by helicopter pilot, and the King was said to be so astonished, that he realized a road must built to this holy place. The locals have variations of this tale but any tourists in the area will hear this as the reason for Road 1001 being built. Its greatest claim to fame is that it was the home to Luang Por Waen Sujinno. Many of the buildings are of wooden construction, including the viharn and a hermit's cell called Rong Yang Kiles or Rong Fai. Relics of Luang Por Waen Sujinno include his dwelling hut, a picture in the pavilion that shows him meditating, and a square-shaped, spire-roofed museum with his ashes, a wax model of the monk, and his personal effects.